BoxId: 844791 – AERwater. The compact performance chain heading for Water 4.0! AERwater. The compact performance chain heading for Water 4.0! 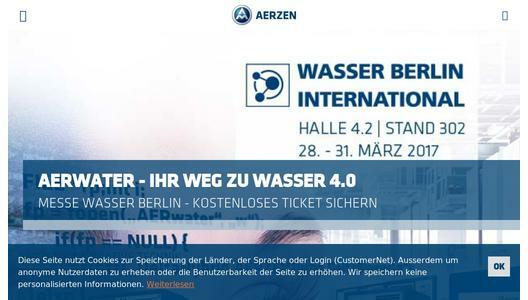 AERZEN faces all opportunities and challenges meant for planners and users working in the wastewater treatment sector in terms of aeration technology. The development of detailed components with which the responsible persons will find their way to Water 4.0 quickly and efficiently. AERwater, a finely tuned complete solution comprising machines, electronics and service packages. Your advantage: The performances succeed individually and in any configuration - equally. Data arise from each production process. Vast amounts of data. Every second. Also at a wastewater treatment plant. Industry has started to convert these data into valuable information. The water industry will carry out the same revolutionary leap, keyword: Water 4.0. The average energy consumption of the organic treatment stage is between 60% and 80% of the operating costs of a wastewater treatment plant. Sustainable efficiency gains can only be realised in case all aeration mechanisms are visualised to the operator and, as a consequence, sufficient process transparency for the optimisation of resources is guaranteed. Water 4.0 in wastewater treatment plants has precisely this goal. How would it be if we could achieve it already today? 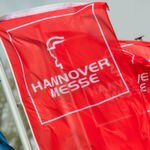 By consequent digitisation and automation of biology aeration? The operators of a plant themselves provide the material for such an efficiency leap: the plant data. The next step: convert the data into clever information networks. AERwater, an innovative machine configuration and a progressive digital control system - these technical core components pave the way towards Water 4.0. Analytical basis for this is the innovative service AERaudit, a volume flow measurement of the real load requirement. precisely and efficiency-oriented on the energy requirement of changing load profiles - from base loads to supply peaks. In addition, the newly acquired transparency grants comprehensive insight into the energy consumption and energy-saving potentials of the blower station. The AERwater modules include besides supporting measures for the realisation (rental units, commissioning, dismantling) and machine room optimisation (heat recovery, sound insulation concepts, room ventilation) the consulting service for the finance of investments through government aid. The load operation in organic wastewater treatment plants is subject to considerable fluctuations. The innovative machine control combination AERsmart achieves extraordinary increase in efficiency in combination with Performance3. It is the intelligent component, which distributes the oxygen requirement among the machinery in a mode through which low, medium and high loads can be processed most efficiently in the existing machinery. Performance scenarios and efficiencies are integrated in the algorithm of the control system. As a consequence, the installed machinery is operated very close to the theoretically highest efficiency level. Service Monitoring can also be replicated in this control system concept in the future. 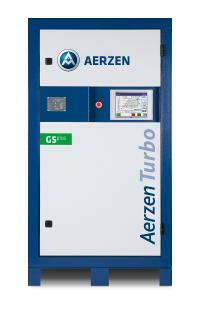 Service intervals will be displayed at any time and spare and wear parts or necessary service can be requested directly in the AERZEN service centre. Changing requirements and possible ageing effects of the aeration system can constantly be monitored. This creates unprecedented transparency over the entire life cycle and provides the possibility for targeted measures. Industrial plants all over the world are provided with gaseous media using AERZEN blowers and compressors. The innovative AERZEN machine technology represents experience of more than 150 years company history. The range of products includes rotary lobe compressors, positive displacement blowers, turbo blowers, screw compressors and gas meters. 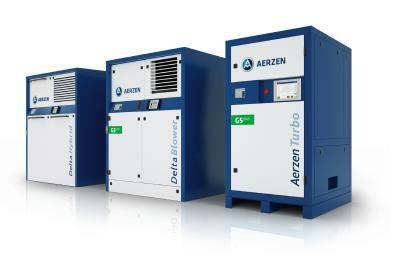 AERZEN blowers, compressors and gas meters are tested and certified according to DIN EN ISO 9001. There is a variety of product offerings from standard products to customised solutions. In addition, the AERZEN After Sales Service offers the complete range of services - from the full maintenance contract to repairs and upgrade of existing plants.